In the daily flood of "shoulds" and "wants" that fill the lives of most executives, The Leader Architect is a fresh and simple guide to tactics and tools that have worked for others--and will work for you. "I could always determine if the plant was profitable just by walking through it. That gut report doesn't translate well to managers, as talented and insightful as they may be. What they found indispensable was Jim Grew's concept of a scoreboard." --Don Jones, Chairman & Co-Founder JVNW Inc.
"The impact of Jim's book on our business was immediate. His results-oriented approach and wisdom were just what we needed to get our company to the next level. Jim's insights and guidance were invaluable." --Hal Cranston, Chairman and Co-Founder Emerald Landscape Co. Inc.
"Jim Grew is truly the 'Leader Architect' by the way he lays out the structure and foundational principals necessary to be an effectively leader. He has an uncanny ability to quickly drill down to the critical elements that help organizations hire and develop high-functioning players. I found it extremely valuable how the book integrates relationships and collaboration to a create the mindset necessary to build highly effective teams. Overall, Jim's insights and examples provided me with practical resources that I will use daily." --Don Bielen, Principal Perkins & Co.
"Small to medium-sized business leaders are trapped by the countless constraints inherent in running small enterprises. Most feel trapped, unable to break out and in the end work for their business rather than having the business work for them. 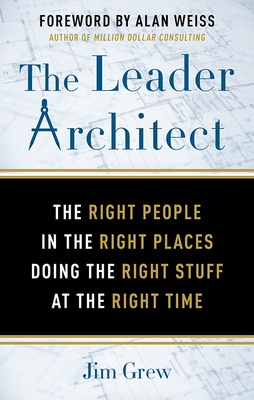 Jim Grew's The Leader Architect addresses these constraints and provides new insights, new ways of thinking and a new perspective on what is otherwise well-travelled ideas providing a key to break free of the trap leaders find themselves in. When was the last time you had a deep dive let alone considered the impact and value myths play in your business, the power or pairs, and what talent is looking for in work? All this and much more with practical steps to help leaders get to the place where they can get The Right People in the Right Places, Doing the Right Stuff at the Right Time." --David DeMots, CEO - Package Containers, Inc., CEO - DHX Advertising, Inc.